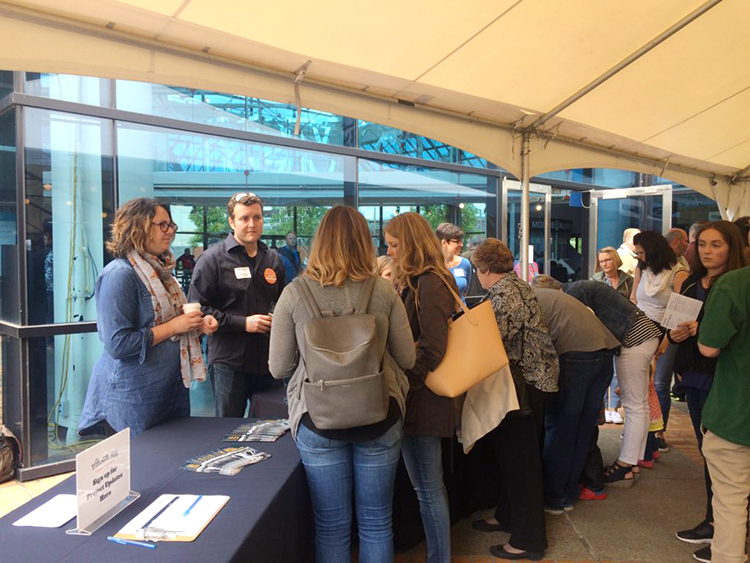 Well over 600 people attended the riverwalk design unveiling and celebration at OMSI on Saturday, June 3rd. Below are some photo and video highlights! See our post on riverwalk design if you missed it or want to dig deeper into the documents. Watch the full riverwalk design presentation from Snhoetta's Michelle Delk. 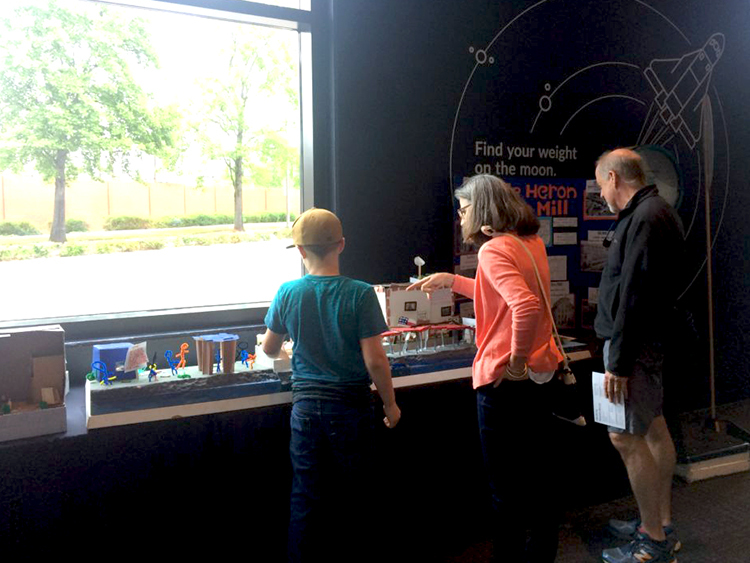 Attendees thoroughly examined riverwalk information boards. 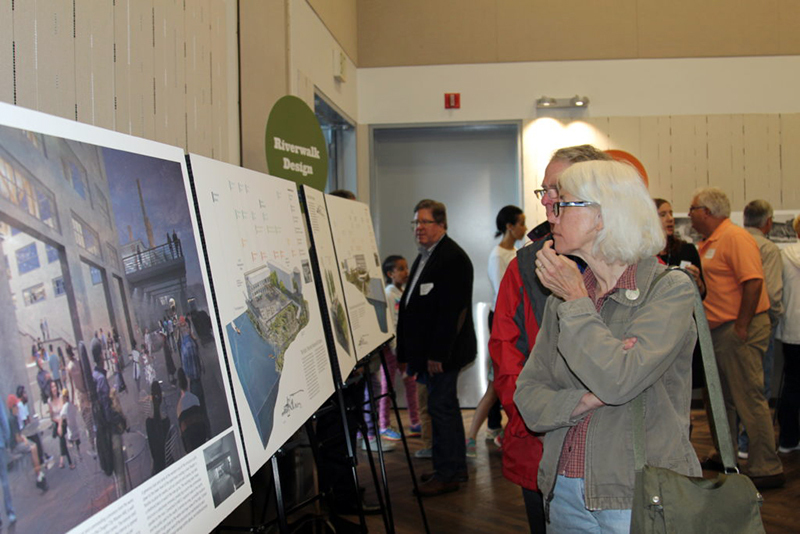 In addition to designs, the project shared information about habitat restoration, interpretive plans, parking and transportation plans, and flood modeling. 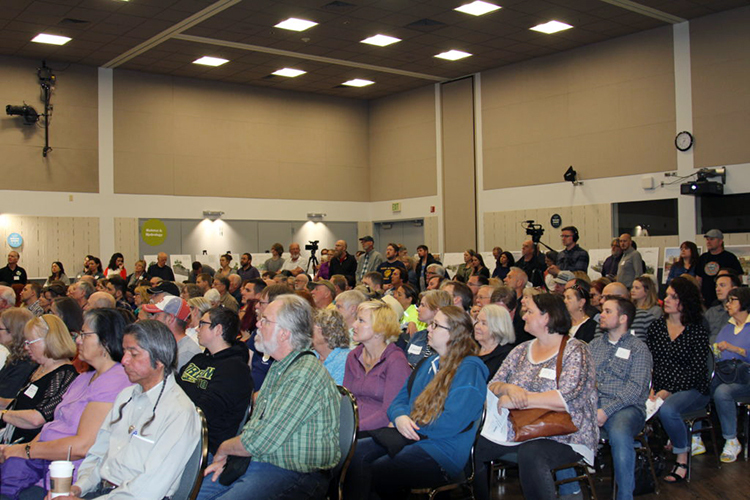 A full house listened in the OMSI auditorium as Michelle Delk of Snohetta describes the riverwalk design. Drummers from the Confederated Tribes of Grand Ronde Community of Oregon singing Stankiya, an old word for Coyote. Information about Coyote as a great changer was shared as well as information about the Clow-we-walla, the people of Willamette Falls who signed the Willamette Valley Treaty of 1855 and were removed to the Grand Ronde Indian Reservation. 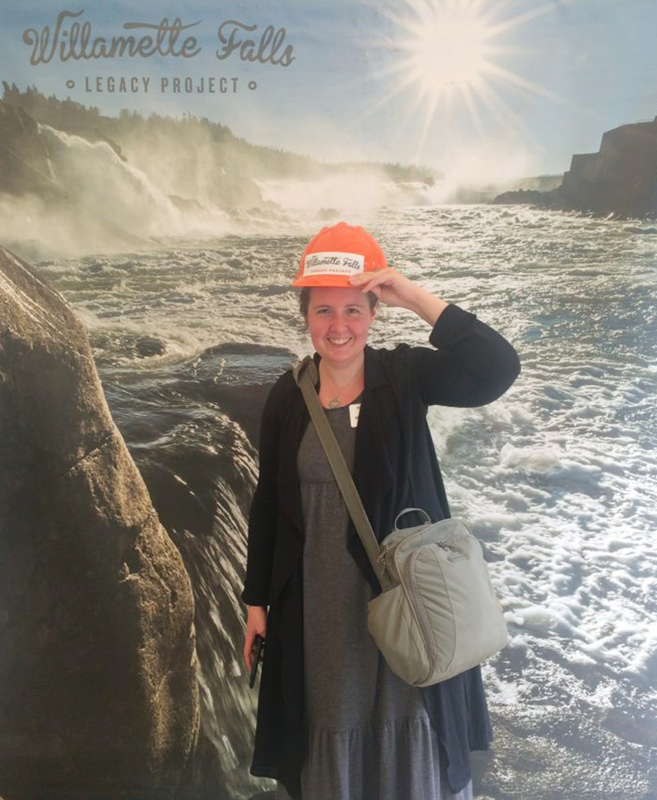 In addition to working with Grand Ronde, Willamette Falls Legacy project has coordinated with four other tribes with a connection to Willamette Falls. 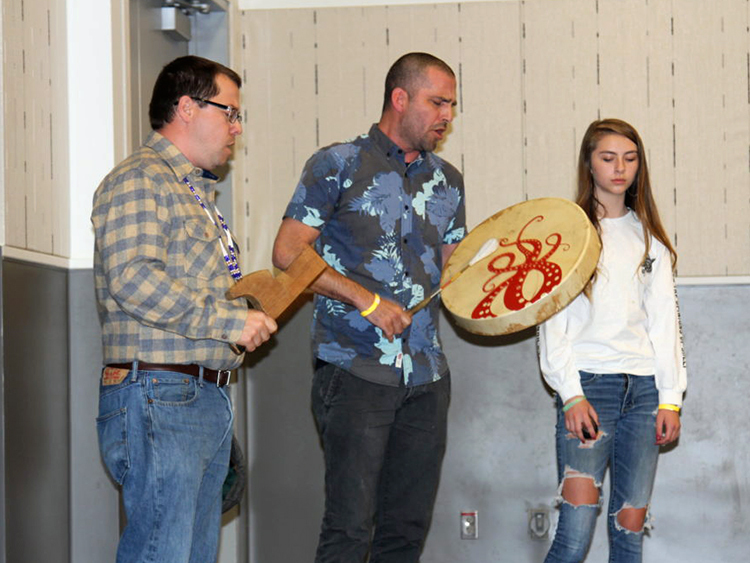 Pictured from left to right Grand Ronde tribal members; David Harrelson, Travis Stewart, and Sophia Stewart. We are honored to have had tribal members of the Confederated Tribes of the Grand Ronde lead a drum song at the event. A model created by 5th graders at McLoughlin Elementary reflects their ideas for redevelopment of the Blue Heron mill site. The students were part of the Architecture in Schools program this year. Their model includes a new animal-focused charter school, an outdoor museum, restaurant and shops, apartments, and a parking garage, among other things, along with the riverwalk. Armand Minthorn, member of the Board of Trustees of the Confederated Tribes of the Umatilla Indian Reservation (CTUIR), spoke about historical events and treaties that affect tribal use of Willamette Falls. The project has met with the tribes' Fish Commission and the Cultural Resources Commission this year to share riverwalk designs and learn about CTUIR's interests and concerns. 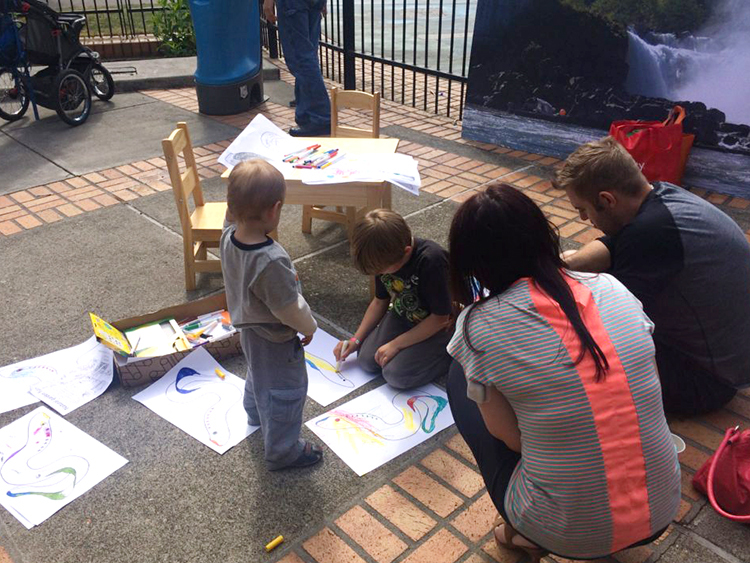 Event attendees were hard at work coloring lamprey cut outs. Pacific lamprey are ancient fish that live near and migrate over Willamette Falls. Like salmon, they spend part of their lives in the ocean and spawn in rivers and streams. Lamprey are also called eels by many, and are a traditional first food of the Native American tribes that fish at the Falls. 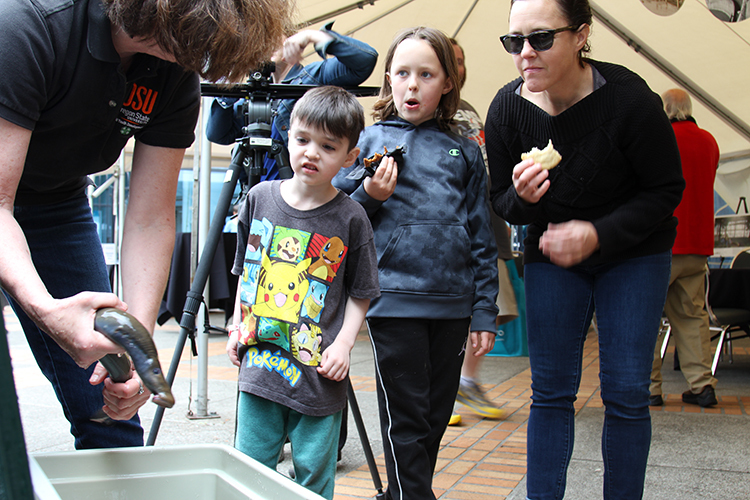 A live lamprey, on loan from the Confederated Tribes of the Umatilla Indian Reservation and part of a traveling US Fish and Wildlife/OSU Extension/4-H Club exhibit, made an appearance at the event. Although some were reluctant to approach him, many event attendees touched the lamprey and some even let it "latch on" to their skin! Attendees gathered to learn about the nonprofit group Rediscover the Falls, the friends group working to raise awareness and funding for the riverwalk. 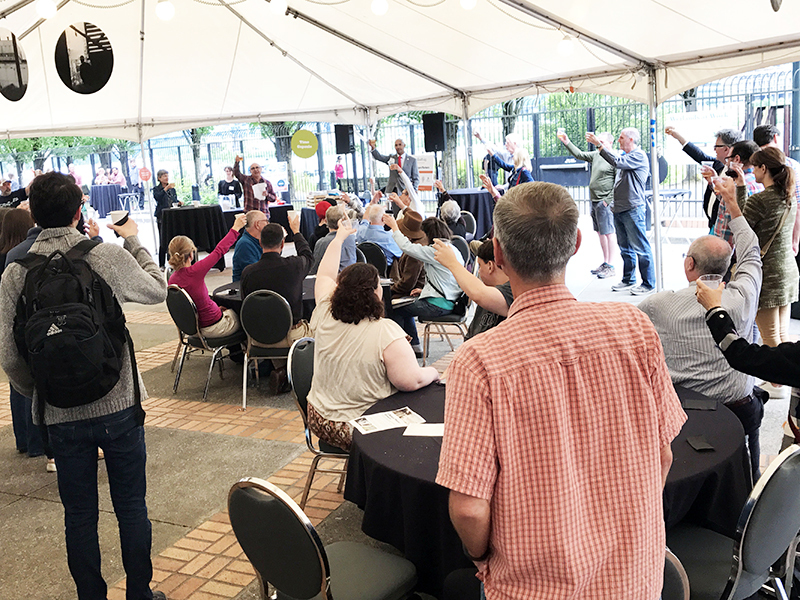 Rediscover the Falls, the project's nonprofit friends group that is fundraising for the riverwalk, led a toast to the future of the Willamette Falls Legacy Project.